It�s been awhile since we�ve heard from Grady Champion. Following the success of his second Shanachie release, Two Days Short of A Week, Champion took a sabbatical of sorts, retreated to his hometown of Canton, MS, where he went back to school to study music, and played in his spare time with fellow rising star Eddie Cotton. He reformed his band, The Grady Champion Revue, and started playing locally in the Central Mississippi area. In July of 2007, he recorded Back In Mississippi Live at the 930 Blues Caf� in Jackson, MS for his own GSM label, with a helping hand from Cotton, who plays guitar on all the tracks. Champion and Cotton take on a variety of tunes, including crowd-pleasing covers of several blues standards (�I�m Ready,� a Jimmy Reed medley of �Baby What You Want Me To Do/Bright Lights, Big City,� �Spoonful,� Lonesome Bedroom Blues,� and �Why I Sing The Blues�). Some of the highlights include �You Got Some Explaining To Do,� which features one of many torrid guitar solos from Cotton, an incredibly funky �I-800-Blu-Love,� "Wine and Women,� penned by Champion and Cotton, �Love and Memories,� a sweet tribute to Champion�s late mother, and the contemporary track, �Policeman Blues,� which features a rap from local artist Jacktown Swiff. Champion�s voice has the perfect mixture of sweet soul and gritty blues. Cotton�s guitar work is phenomenal, with stinging leads, tasteful fills, always right where they need to be. Their interplay is so seamless, that it sounds like they�ve been playing together all their lives. Also lending support are Champion�s son Marquis on bass, Calvin Wilson on keyboards, and Frank White on drums. Previously, Eddie Cotton recorded two outstanding live discs at Jackson�s Alamo Theatre. 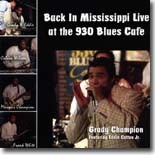 Back In Mississippi Live at the 930 Blues Caf� belongs next to them. It�s further proof that contemporary blues are alive and well in Mississippi, and in good hands. 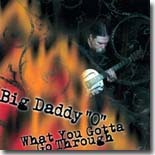 Check this disc out at www.cdbaby.com. These days it�s hard to find a record made in the Mississippi Delta that doesn�t feature Bill Abel as a performer or in some behind-the-scenes role. He recently participated in the M for Mississippi project as a performer, recording and mixing all of it from his rolling Big Toe Porta-Studio (a Volvo station wagon with recording equipment installed where the backseat used to be), sometimes in less-than-favorable conditions. He�s a regular at most of the blues festivals in the Delta, and has lent musical support on several of Big George Brock�s recent releases, Hubert Sumlin, Cadillac John Nolden, and also on several records from the Broke & Hungry label. Abel�s latest release, One-Man Band (Blue Skunk Music), naturally features him as a solo artist. He plays lead and rhythm guitar, hi-hat and snare with one foot, and bass drum with the other. His raw, coarse vocals complement his amazing dexterity. There are 16 tracks on One-Man Band, all recorded live with no overdubs, all produced and arranged by Abel. They make for compelling listening, as they range from the droning Mississippi Hill Country blues to the wild and raucous Delta sound. Abel�s own songs blend well with the standards, as he captures the same rowdy, rough blues and even mixes in a couple of spiritual tracks. Highlights include �Barkin� All Nite,� �Mailman,� �The Lord Will,� �Goin� Down,� and a pair of instrumentals (�Don�t You Hurt� and �The Waiting�). 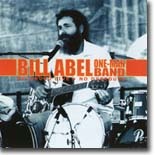 If you�ve been listening to any recent Mississippi Delta blues releases, you�re already familiar with Bill Abel. One-Man Band puts him at center stage and shows that he�s more than capable of being the main attraction. Delta blues fans should definitely get their hands on this one. When I first heard Tim Lothar, he was a drummer with the group Lightnin� Moe, a powerhouse Danish blues band. Several years ago, Lothar taught himself to play guitar and embarked on a solo career. His first disc, 2006�s Cut To The Bone, was recorded in his living room and was a sparse, intimate release that showed Lothar to be a quick study, not only as a guitarist, but also as a composer. His second disc, In It For The Ride (TLP), finds Lothar in the recording studio, with another stunning mix of Mississippi Delta blues and strong original compositions. It�s absolutely amazing that Lothar has only been playing guitar for about five years. His fretwork is astounding at times and his vocals are dynamic. All of these tracks feature Lothar solo on guitar except for one appearance by Georg Boeje Olesen (keyboards on �I Will Be Home Again�). Simply put, this is one of the most enjoyable acoustic releases I�ve heard in a while, loaded with energy and passion. It�s been fascinating to watch Lothar continue to develop as a guitarist, singer, and performer. He was recently selected as Danish Blues Musician of the Year, and one listen to In It For The Ride will provide ample proof that it was a wise choice. Go to www.cdbaby.com and listen for yourself. Canadian Steve Rowe first embraced the blues as a teenager. He later formed his first band, Skid Rowe, in the early �80s. He honed his craft playing behind headliners on the Montreal blues scene, and eventually started writing his own songs. His first release was in 2000. Rowe�s music is a mix of �50s Chicago blues and �60s British blues and his guitar work is influenced by the likes of Eric Clapton, Michael Bloomfield, B. B. King, Albert King, and Freddy King. Since 2002, Rowe has worked and composed songs with bass player Alec McElcheran, who has a background in jazz, classical, and pop music. 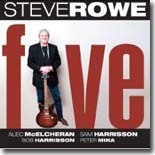 Rowe�s latest disc, Five (Blue Skunk Music), is his third release. It features 15 original compositions either written or co-written by Rowe and McElcheran. The top notch backing band features Peter Mika (keyboards) with Sam Harrisson and Bob Harrisson splitting time on drums. Highlights include the clever opening track, �Believe I�m Gonna Go Back Home,� �The Black Hole,� about one of those joints your mama warned you about, �I Ain�t Buyin�,� �Little Too Young,� a jibe at the young gun musicians out there with all the technology and none of the know-how, and the smooth instrumental �More Grits.� �Gone Fishin�� is a light jazzy tune with a swinging guitar break, and �A Cat Like That� is reminiscent of the spoken-word R&B novelty songs of the early �50s. �Like A Motor� is another strong jazz-based number, and �Merry Go Round Blues� is a mischievous rocking blues. Rowe is a fine guitarist and is equally comfortable playing jazz, blues, acoustic, or just rocking the house down. The closing track, �La Vie en Blues,� really allows him to stretch out and put his chops on full display. Guitar fans will find a lot to like with Five, a disc of strong original songs that should get Steve Rowe more attention beyond the Canadian border. 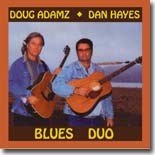 Blues Duo (Blue Skunk Music) is an acoustic album featuring guitarists Doug Adamz and Dan Hayes. Hayes has been active in music since the 1960s, fronting several groups in California during that time and opening for acts like Charlie Musselwhite, the Ford Brothers, and Brownie McGhee & Sonny Terry. Later, he moved to Nashville and became a songwriter, but has recently returned to his blues roots. Adamz, a Texas native who has lived in California for many years, is a versatile musician, has played an amazing array of musical styles during that time, including blues, folk, country (he also plays fiddle), and even belly-dance music. The pair has worked together for many years and thousands of shows in the Northern California region, but Blues Duo is their first joint release. As might be expected from the duo�s backgrounds, the focus on Blues Duo is traditional blues with a touch of country mixed in. The set was recorded live, with Adamz and Hayes playing guitar, harmonica, and taking turns on vocals. That they�ve worked numerous shows together is obvious from the first note, as they present a seamless rapport. The duo also wrote all ten tunes. The highlights are many, including the gently rolling opener, �Traveling Man,� �Pawn Your Guitar,� a beautiful played slow blues, �I Was Crazy,� and �Money, Love, & Time.� �Oh Lightnin�,� is a nice tribute to Lightnin� Hopkins, and �Mini Skirt Alert,� is a lively piece that closes the disc. The only real drawback to the album is that it�s a bit short, clocking in at just over 30 minutes. It would have been great to hear a few more songs. Brevity aside, Blues Duo is a highly enjoyable album of gentle acoustic blues from a talented pair of guitarists. It will probably lead you to seek out more of Doug Adamz and Dan Hayes� recordings. Jim Suhler has played lead guitar for George Thorogood and the Destroyers since 1999. Even though that�s the Texas guitarist�s best-known gig, he has also led his own band, Monkey Beat, for over 15 years, releasing several discs of hard-driving Texas blues and rock since the mid �90s. Their latest release, Tijuana Bible, for Underworld Records should please their longtime fans and should bring in some new converts as well. The smoldering �Black Sky� could cause your stereo to catch fire. �Deep Water Lullaby� is a slow blues with Joe Bonamassa on lead guitar, and �Years of Tears� features some impressive slide guitar from Suhler. Former Wet Willie lead singer Jimmy Hall adds guest vocals on the funky �Po� Lightnin�.� �Border Rock� and �Sunday Drunk� are a good-time rock and rollers, �Mexicali Run� is a gritty Texas shuffle, and the aptly titled �Chaos in Tejas� returns to the temple of Billy Gibbons. Closing out the disc is a moody acoustic track, �Juice,� a scorching cover of Rory Gallagher�s �I Could�ve Had Religion,� and �Cold Light of Day,� a sober piano track. It�s hard to find a hole in this disc, other than the one in the center. There�s not a bad track to be found. Clocking in at over 70 minutes of music, it doesn�t seem long enough. In addition to Monkey Beat (Carlton Powell � bass, backing vocals; Shawn Phares � keyboards; Jimmy Morgan � drums), the cast of characters lending Suhler a hand consist of Bishop, Bonamassa, Hall, Buddy Leach (saxophone on �Border Rock� and �Years of Tears�), Paul Hollis (drums on �Drunken Hearted Boy), Cheryl Arena (harmonica on �I Could�ve Had Religion�), and co-producer Tom Hambridge (backing vocals and percussion). 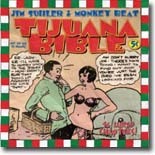 For fans of unrelenting Texas blues/rock, Tijuana Bible is an essential purchase. Looking for something different to pop into your stereo? Look no further than Waylon Thibodeaux, Louisiana�s Rockin� Fiddler. Thibodeaux is one of Louisiana�s best-known artists and performers. His music mixes Cajun with Zydeco, Swamp Pop, Country, and a little Rock & Roll. He�s recorded three previous CD�s that have featured guest musicians like Jumpin� Johnny Sansone, Tab Benoit, and Gina Forsythe, and his music has appeared on TV commercials and movies. Thibodeaux recently signed up with the New Orleans label, Rabadash, and has released his latest CD, Who�s Yo� Cher Be� Be�, which is guaranteed to get you on your feet. In making this disc, Thibodeaux has brought in composers like Anders Osborne, Thomas Shepard, Gordon Bradberry, and Ken & Pershing Wells, and the result is probably the closest to a �mainstream� album as Thibodeaux has released so far. As advertised, this music is an infectious blend of styles and Thibodeaux shines on the uptempo numbers like �Sweet Colinda,� �Chenier Tigre,� �Giving Up The Ghost,� �Hey Maman,� �Cher Bebe�,� �Just To Have My Girl,� and �Some Kinda Voodoo.� �Big Blue Tears� has the potential to be a future Swamp Pop classic, and �Riding On These Roses,� is a strong country-based tune. �Sometimes A Fiddle� is an autobiographical sketch of Thibodeaux�s chosen instrument, and �Louisiana Rain,� penned by Osborne is a churning rocker. The backing band, which includes Mark Dufresne (bass, harmony vocals), Randy Carpenter (drums), Dwight Breland (steel guitar), Mark Duet and Jan Clements (keyboards), Richard Toups (percussion), and harmony vocals from Wendy Foret, Tim Ernest, and Theresa Andersson (who also plays violin), is excellent in support, but Thibodeaux is definitely the featured attraction, and he gives a wonderful performance. 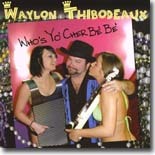 Fans of Cajun, Zydeco, and Swamp Pop will love Who�s Yo� Cher Be� Be�, which sounds like a breakthrough release for Waylon Thibodeaux. Owen Tufts, AKA Big Daddy �O,� is one of Louisiana�s best-kept secrets. He has been making music for over 30 years in the road houses and bars of Louisiana and Mississippi, playing his gentle brand of blues, a mix of well-chosen covers and inspiring original songs. Despite his imposing 6�6� presence, he charms audiences with his warm vocals and nimble acoustic guitar work. His latest release, for Rabadash Records, is What You Gotta Go Through, an outstanding 18-track set that finds the big man at his very best. He wrote or co-wrote six of the tracks, including the reassuring �Don�t Worry About A Thing,� one of four tracks that features Jim Suhler on guitar. �Attitude� is another standout, as is the moody �Gulf Coast At Dawn,� which features Dwight Breland�s pedal steel, and �Got No Blues Today� is funked up by producer John Autin on organ and Jim Markway�s bass. Producer Autin gives the disc a relaxed aura. It sounds like it was recorded at home with a bunch of friends and family either listening or joining in. It�s one of the most intimate discs I�ve heard in a long time. What You Gotta Go Through will be a treat for fans of acoustic guitar or just good music in general. Jelly Bean Baby (Straight Shooter Records) is the third CD of Danish musician Peter Nande�s that I�ve heard, and each one seems to progressively get better. The CD was produced, as were the last two, by James Harman, and it�s full of original material recorded in Oceanside, California. Peter Nande wrote or co-wrote all except one of the 13 tracks, and on the co-written tracks, James Harman was the other name on most. The CD opens with the title track, �Jelly Bean Baby,� which is pure 1950s medium tempo jive blues with tinkling barrelhouse piano and some lovely honking sax. It leads nicely into a shuffle from the same sort of era, �Beware Brother,� and then slows down with the third track on the CD, �Slo� Poke.� This has a taste of a reggae beat going on in the background, some gentle organ playing from Neil Wauchope, and a couple of understated saxophones. The tempo stays down low for �Ridin� The Gravy Train� (Gary Primich on harp) and �In A State Of Bliss,� a couple of well written tracks with lots of flavour, and then picks up with another shuffle, �Walk The Talk,� which gives some prominence to Nande�s great harmonica playing above Carl Sonny Leyland�s magical piano, sounding like it lives in New Orleans. The album alternates nicely between tempos and styles, with some of the tracks getting excellent harmonica treatment from Peter Nande � track eight, �The Can�t Hardlies,� being a good example and qualifying as one of the blusiest tracks on the album. Having said that, every track has its qualities and it�s all a matter of taste � there�s not a bad track on the CD. My favourite track though is �The Stubble,� a rural blues instrumental featuring harmonica, drums and percussion. It�s pure Sonny Terry, and absolutely faultless (unless you count the fact that I�d love it to last longer!). The album winds up with a jazz/blues instrumental showcasing Neil Wauchope�s organ and Ronni Busack-Boysen�s guitar, playing some really nice Wes Montgomery style riffs. Listening to this CD leaves you waiting impatiently for the next one!! Well, here�s the latest in what is becoming a long line of releases from the best blues band in the part of Europe that used to be called Yugoslavia. The Point Blank Blues Band are based in Belgrade in Serbia, and as anyone that has listened to their previous release will tell you, they are good. This is a good solid blues band that always impresses with it�s output, and this CD, A Whiter Shade of Blue (RTS Records), is no exception, with lots of different (some unexpected) influences, including some haunting stuff from the Balkans and beyond. All 12 tracks are written by the main man of the band � Dragoljub Dr. Crncevic (no, I can�t pronounce it either), otherwise known as just Dr. As well as being an accomplished songwriter, he�s also on vocals and guitar on the album � don�t forget that he�s writing in English, which is not his native language, which makes the accomplishment even more marked. There are one or two strange influences on the album (or strange for a blues album), but they work! How about track three, �A Song For V,� which sounds like Leonard Cohen singing the blues, or track eight, �No Pride,� country & western meets the blues! In amongst the tracks on the album are one or two real gems � track two, �Belgrade Blues,� has references to the recent troubles in the former Yugoslavia � it�s poignant, sad and true, and that�s what the blues is about. This track alone makes the whole album worthwhile. Track six, �Last Pain,� combines Balkan violin (Momcilo Moma Stanojevic) with the blues � it reminds me of an old Archie Shepp jazz track, the title of which has slipped my mind � this is fusion at its very best. Track 11, �Roll On,� is a hard driving boogie instrumental that really rocks, with shades of Jimmy Smith from Darko Grujic on keyboards. If you haven�t already heard this band, have a listen and find out what Eastern Europe can offer � if you have heard them before, then you�ll be heading out to get what is probably their best album to date. Dan Toler and John Townsend have a lot experience between them � Toler playing with The Allman Brothers, Dicky Betts and the Gregg Allman Band, and Townsend playing with The Renegades and also writing for Gregg Allman. With backgrounds like this, you would expect them to be very competent musicians, and you wouldn�t be wrong in that assumption. From 1992 Toler and Townsend have been writing songs together, and it was a logical progression that they would get a band together, which they did part time in 2002. When The Renegades folded, the two got serious about things and The Toler Townsend Band finally got serious. Their self-titled album is out in March 2009 on Blues Boulevard Records. Whilst it�s not a pure blues album, there are some tracks that are nothing but the blues � the rest is blues/rock with a lot of influence from The Allmans, Wet Willie, Molly Hatchet & others. John Townsend co-wrote all but three of the 11 tracks on the album, and Dan Toler co-wrote the others, so it�s all original music and all good music. The CD opens with �Loneliness,� a medium tempo blues/rock number that sets the tone for the rest of the album � the band comes back to blues/rock after excursions into ballads & a bit of country rock. Track four, �Full Time Fool,� is very reminiscent of '80s southern rock, with a good driving beat, track five, �Ali Shuffle,� is probably the blusiest (and the best) track on the album � I�d love to hear this band do a full album of this sort of material! It has Tony Perrino on Hammond B3 laying down a great backing, with the guitar of Dan Toler above it. The tempo of the CD is mainly on the up side, but there is some slower material to satisfy those who want to chill a little. 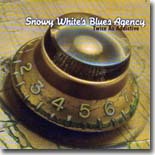 Originally recorded back in 1988, Blues Boulevard Records in Belgium has stuck to their theme of re-releasing great blues albums and re-issued this great Snowy White's Blues Agency double CD album, Twice As Addictive. I had forgotten just how good a blues musician Snowy White is � and always has been � and listening to this album again after so many years brought it all back. The first chapter, on CD1, is a mix of covers and Snowy White originals with CD2 being all originals songs written either by Snowy or by Graham Bell, who appears playing rhythm guitar & harmonica as well as supplying some of the vocals. CD1 opens with the B.B.King number, �Woke Up This Morning,� and then moves on to the Darnell/Hawkins song, �The Thrill Is Gone,� which is so often associated with B.B.King � a nice link. Little Walter�s �You Know It Ain�t Right� comes next, before the first of the Snowy White tracks. �Change My Life� is probably one of Snowy�s best know numbers, and this is a very good version. This is followed up by another Snowy White written track, the instrumental �Agency Blues� with some trademark Graham Bell harmonica � just fantastic blues. And there�s another good instrumental in track 10, which is �The Agency Shuffle.� Track six, �Judgement Day,� confirms just what a good writer Snowy White is, as well as being a great guitarist � the album just gets better and better! White�s version of Mose Allison�s �Parchman Farm� is frenetic and compelling � something to really get feet tapping! For my ears, the last track on CD1 is the best, but it�s a really hard pick as there is so much good music here � it�s Howling Wolf�s �No Place To Go� and it�s something the Wolf would have enjoyed listening to, I�m sure. From then on the tempo alternates between fast, medium and slow, without a bad track amongst them, �When You Broke Your Promise� even has a semi-bossanova beat going on! All in all, CD1 is the better one of the two, but having both in one package is great. Take your mind back to the '80s and listen to some great blues. 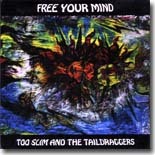 Believe it, or not, Free Your Mind (Underworld Records) is the 14th album from the rock/blues band Too Slim & The Taildraggers � that�s right, 14! The first seven were released on Burnside records, before the band made the switch to Underworld Records, and they have just got better and better. The band (a trio of guitar, bass, and drums) is joined by guest artists Lauren Evans, Todd Smallwood, Pamela Mattioli & Paula Mattioli on this follow up the successful 2007 album The Fortune Teller, and they lay down a heavy, tight, sound all the way through the CD. Make no mistake, this is heavy blues rock and not late night gentle listening � but that�s not a criticism, that�s the genre that perfectly suits this band. The album opens with �When You Love Somebody,� a good hard driving rocking blues that really grabs your attention and leads nicely into �Last Train.� Things slow down a little, but keep the rock/blues flavour, with �Devil In A Double Wide� and then track four, the title track is slightly reminiscent of Tom Petty & The Heartbreakers, and it�s GOOD! By the time that track five arrives, you are hooked! �Testament� is slow, atmospheric and moody but �Been Through Hell� picks up the tempo just a little. Things stay on the slow side until track 10, �This Phone� picks up the tempo temporarily and leads into the ultimate track �The Light,� and another slow and moody track with the fantastic voice of Lauren Evans � and probably my favourite on the CD � they made me wait for it, but it was a pleasant wait!. Good album for rock/blues fans. 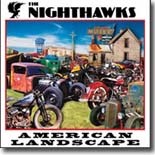 The Nighthawks was formed way back in the 1970s by Mark Wenner (vocals & harmonica) and Jimmy Thackery (who left in 1986 and now has his own great band). American Landscape (Powerhouse Records)is their 22nd album, believe it or not, and it�s the follow up to Nighthawks Volume 4, which came out in 2007 � they first recorded on the Powerhouse label back in 1991, left and came back again. Judging by this CD, Powerhouse must be very pleased to get them back on the label. The opening track really lets you know what�s in store � �Big Boy� is a medium slow tempo with a hard driving beat to it � great harmonica from Mark Wenner, who really blows up a storm. I was surprised to find a Tom Waits track ("Down In The Hole") and two Bob Dylan tracks ("She Belongs To Me" and "Most Likely You Go Your Way and I�ll Go Mine") on the album, but they are given a nice bluesy treatment and they aren�t out of place � and the same can be said for tracks by Steve Cropper and Berry Gordy. The Tom Waits track is particularly good and suits the band�s style exactly. Track four is �Matchbox,� credited in the notes to Ike Turner � I�m sure it was a Carl Perkins number originally, but maybe I�m wrong as I�ve seen it credited to Ike Turner before (on a Janiva Magness album). Whoever wrote it is fairly unimportant I guess, as the band make a very good job of it. There�s a little bit of everything on this album � Tom Waits, Bob Dylan, some rockabilly country blues with Johnny Castle�s �Jana Lea,� soul blues courtesy of Steve Cropper�s �Don�t Turn Your Heater Down� with definite '60s flavour, and a bit of jazzy jump blues style with the last track �Fishing Hole Theme�, an instrumental with Johnny Castle on upright bass driving the others along. I�ve been trying to pick out a favourite track from the album, but it�s really difficult with so many good ones � I�m going to pick the Dylan track, �She Belongs To Me,� because I love the original and to my mind the Nighthawks have given it such a different flavour that it�s not just a cover version, they�ve really put their stamp on it.